Recently we spent a busy weekend in the town of Portishead, just outside of Bristol and naturally found ourselves needing to eat out in a couple of the restaurants dotted around the Marina there. The two restaurants we chose were a stone’s throw away from each other and yet our experiences of their allergy-friendly services were worlds apart. The first was Bottelinos, an independent small Italian chain in the South West, who were confident that they could cater for M’s food needs and had gluten-free options clearly marked on their menus. The first hiccup came when G asked for the “Pasta Maximus”, a bolognese sauce with a meatball, and was disappointed to be told that she couldn’t have it as the sauce wasn’t gluten-free. We had already had to discount a large proportion of the other pasta dishes because they weren’t dairy-free, so my disgruntled girl moodily requested steak and chips instead – and that’s when the fun and games really began. Our waitress nipped back to the serving counter and spoke to the chef, before coming back to tell us that the chips weren’t gluten-free either and G’s choices were rapidly disappearing. Feeling somewhat concerned about what we could order for our increasingly hungry pair, I asked for the allergens listing so that I could see exactly what was on offer for G and started flicking through the pages with my fingers tightly crossed that I would find something she would enjoy. The first problem quickly became evident when every pasta dish on the menu was marked as containing gluten, which I assumed was because of the pasta itself rather than the base ingredients in the sauces and there was no easy way to distinguish which sauces actually contained gluten and which were really gluten-free. This type of wholescale approach to allergens may seem sensible, but makes it extremely difficult for an allergy-sufferer to work out what they can or can’t choose without extensive help and detailed knowledge from waiting, kitchen and managerial staff. Then came the next whammy. As I ran my experienced eye over the rest of the allergen menu, I spotted that the chips were marked as being gluten-free, despite the advice we’d already been given to the contrary. It was far too late for us to up-sticks and search out somewhere else to eat dinner, so I asked to speak to the manager, a request that was met without delay. My first question was about the Maximus sauce, the only one that G was prepared to even consider for her supper, and we were told that whilst the bolognese sauce was gluten-free, the meatball wasn’t and so, having dismissed pasta as an option, we quickly moved on to the matter of the chips. The explanation given here left me stunned and unlikely to rush back for another meal with the children in tow. The manager explained that they had a dedicated gluten-free fryer, so the chips usually would be safe; however (and this is the important bit), on a Friday night they use that fryer to cook everything because of how busy they get and the need to keep up with orders. Not only was I extremely disappointed that they didn’t consider being able to cook gluten-free foods a priority on a busy evening, but I have serious concerns as to whether they are really able to thoroughly clean the fryer and change the oil before Saturday’s service begins; or indeed if they even do. Eventually we were able to compromise with the manager and the chef cooked G’s chips in a separate pan to ensure the cross-contamination risk was reduced, something we were able to watch from our table. M was given a plate of grilled chicken and sliced cucumber, though he did find a small piece of lettuce when he was half-way through, which again suggested that their approach to allergy-friendly catering wasn’t good enough. In fact, both children did suffer some delayed symptoms in the 24 hours following our meal, which supported our concerns that the cross-contamination risks hadn’t been as well-managed as we’ve experienced elsewhere. In stark contrast, the second restaurant and our location for Sunday lunch with old friends, impressed us from the very start. Mike had popped in to Aqua beforehand to ensure that a repeat of Friday’s disaster was avoided and their response couldn’t have been more different. Not only was he given a copy of their allergy menu to show G, but both the chef and the manager came to talk to him about everything we needed. The chef painstakingly went through every item on the menu, explaining which could be made both gluten- and dairy-free for G and made some suggestions of other tweaks that could be made to suit her tastes. As for M, the only cucumber to be found in the restaurant is behind the bar, so the chef made a note to ensure that one would be available for M’s Sunday lunch and again reassured Mike that they could make a tasty dish to meet his complex diet. It was already sounding like a much more promising meal and we couldn’t wait to actually try it out on the day itself. When we arrived on the Sunday, our booking had been well-annotated to indicate M’s dietary needs and the waitress was aware of what he could eat and how the food was going to be prepared. G chose steak and chips again with the added extra of some goats cheese to replace their standard sauces and M was served a beautifully presented dish of grilled chicken on an apple, pear and cucumber salad. What made the meal even better for M was the lemon sorbet he was able to enjoy for pudding. I had seen it on the dessert menu and asked the waitress if I could see the tub itself to check the list of ingredients. She brought the container to the table and we were thrilled to see that it was indeed safe. The options for G were not so good given she doesn’t like sorbet, but she was able to enjoy a plate of apple, walnuts and sheep’s cheese, which kept her, and me, happy. Our Sunday lunch was a truly fantastic affair and so different to the problematic experience we endured on the Friday night. It shows what turns a good restaurant into a great restaurant and somewhere that people will visit time and time again. I wouldn’t hesitate to recommend Aqua to anyone looking for allergy-friendly restaurants and have passed their details on to the FreeFrom Eating Out Awards as somewhere worth knowing about and deserving of recognition. Bottelinos, it would appear, could learn a lot from their nearest neighbour in Portishead and the weekend really was a tale of two restaurants. This entry was posted in Chronic Illness, Family, Food Allergies, Reviews, Travels and tagged allergen menu, Allergy, allergy-friendly restaurants, Aqua, Aqua Portishead, Awareness, bolognese, Bottelinos, chef, cross-contamination, cross-contamination risks, Dairy free, dedicated fryer, eating out, EGID, family, Food, food allergies, gluten-free, Gluten-free diet, Italian, parenting, pasta, pasta sauce, Portishead, restaurants, Special Diets on July 28, 2016 by bluesingingdragon. A weekend in London could only mean one thing for our family: the opportunity for a night at the theatre and a meal out, something we all love to do. With a full day planned at the Allergy Show at Olympia, we decided that a hotel in Hammersmith would best meet our needs for the Saturday night and that rather naturally led us to investigating what shows were on in nearby venues, rather than necessarily having to trek into central London for the evening. Last year, G and M took part in a local drama summer school and have been serenading us with snippets of the songs from Bugsy Malone ever since, so we were delighted to spot that the Lyric Hammersmith is home to the fantastic showmanship of this very musical until the start of September and knew that we would all enjoy a night on the tiles with Bugsy, Fat Sam, Tallulah and the rest of the gang. The challenge is always to book somewhere safe for M to eat and this time I wanted to see if we could escape our regular haunts and find somewhere new instead without venturing too far from our final destination. I had spotted their Bar and Grill restaurant when I was browsing the Lyric’s website and the encouraging presence of the occasional “GF” on the menu as well as chicken skewers suggested this was a lead worth investigating further. I soon got Mike onto the case and he came away from the phone call incredibly impressed with the conversation he had just had. He had spoken to the restaurant manager, who, having taken notes about what G and M could eat, quickly made informed suggestions about the dinner that they could prepare for them to enjoy during our visit. Of course, the proof of the pudding is, as they say, in the eating, but we were hopeful that they would meet the high expectations we now had for the meal and booked a pre-performance table timed to fit exactly into the short gap we had between finishing at the Allergy Show and sitting down to watch Bugsy. We were impressed from the start. M was still confined to his wheelchair, but a helpful security guard seated at the main reception desk offered to show us around the building to the access entrance and got us safely upstairs to the restaurant. Our waitress made mention of the allergy requests attached to our booking as she showed us to our table and within minutes the restaurant manager came to the table to discuss with us what they would be cooking for G and M that night. I was delighted to learn that they had remembered and met their first promise – to buy in rice especially for M, something not usually on their menu – so that he could enjoy a complete meal with the rest of the family. There had been a small miscommunication about M’s safe foods as a mixed leaf salad was mentioned to accompany the rice and plain, grilled chicken, but thanks to their diligence in running through our needs before cooking began, we were able to correct that mistake and instead an impressive cucumber salad arrived as the side dish. G was equally well catered for and was delighted with her GF chicken bites, chips and peas. 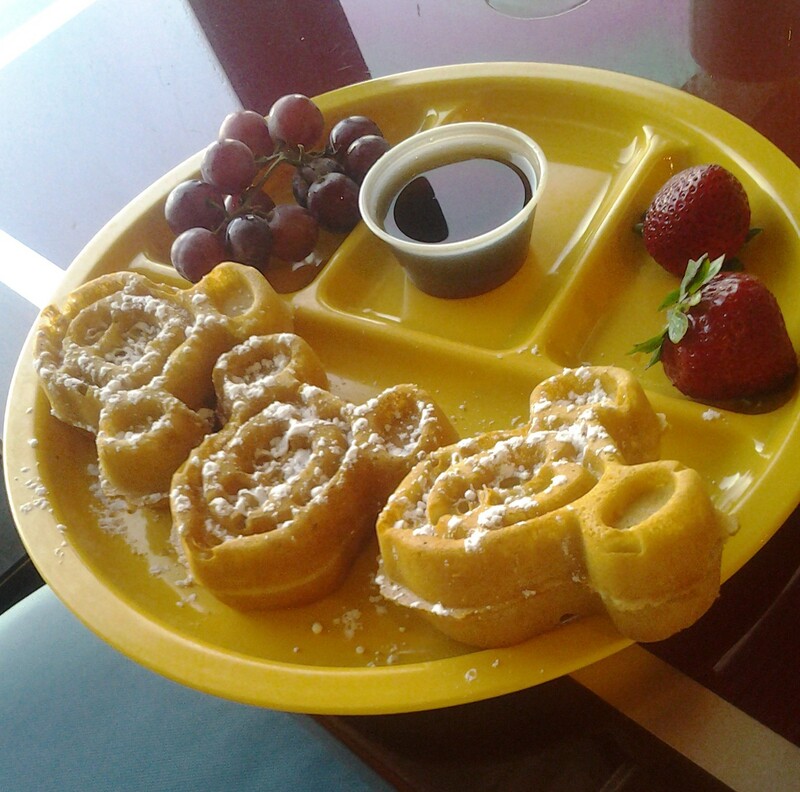 We asked if both portions could be made adult-size as we are now well-used to the children eating huge amounts when we go out for dinner, another request that was willingly accommodated and we really felt that nothing was too much for this fantastic restaurant team. The menu wasn’t extensive, but it was well-prepared and delicious and I wouldn’t hesitate to recommend it to anyone looking for a great allergy-friendly meal in Hammersmith. This entry was posted in Chronic Illness, Family, Food Allergies, Reviews, Travels and tagged Allergy, allergy-friendly restaurants, Awareness, Bar and Grill Lyric Hammersmith, Bugsy Malone, Dairy free, drama, eating out, family, Food, food allergies, gluten-free, Gluten-free diet, London, Lyric Hammersmith, M-friendly, parenting, restaurants, Special Diets, summer on July 18, 2016 by bluesingingdragon. Sometimes you just need some time off; a week away from it all; an opportunity to have a break from the everyday, to just rest and relax and be. 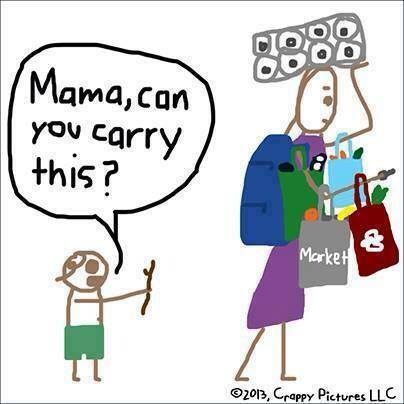 The thing is that that is hard enough to achieve when you’re a parent and near on impossible when you’re a special needs parent. The stress of leaving your chronically ill child with someone else, even when accompanied by a small novel’s worth of detailed instructions about what to do in every possible and conceivable situation, threatens to overwhelm and can seemingly be insurmountable for a day or two, let alone more than that. Mike and I are lucky that my Mum lives close enough to give us some nights off during school holidays, but those days usually mean longer hours at work for me as I attempt to make up time missed for hospital appointments with M and include only the occasional trip out to the cinema or for dinner somewhere where we aren’t tied to the essentials of chicken, rice and cucumber of our everyday menus. and have to confess that at that point I had absolutely no idea what she was talking about! A quick unscheduled peek at my Twitter feed and a long look at my e-mails later, I was stunned to learn that she was indeed right and I had won a 4-night stay in Italy thanks to gluten-free producer Dr Schar and the Allergy and Free from Show, Liverpool. It has taken a little while to put all the necessary pieces in place, but finally, last week, 6 full months since I first received that message, Mike and I left G and M in my Mum’s more than capable hands and jetted off for a much-needed break from it all. Getting to that point did take some effort and there were last-minute wobbles before we finally left. It took an unbelievable amount of time to confirm the dates for our hotel stay due to the relaxed attitude of the Italian hotel staff and our flights were researched and scheduled by me once I knew the preferred airports for us to travel to and from. Two nights before we left, Mike questioned whether we really could go abroad given M’s current ill-health, but we trust my Mum implicitly and knew we needed to take some time for ourselves. That’s something that my Mum supported fully as she knows that reality as well as we do due to my T1D diagnosis at age 9. The truth is that you should never under-estimate the impact of a sick child on a marriage: the focus naturally shifts from each other to that child and home life inevitably revolves around what they need in every waking moment. In our household, those needs have not just been during the day, but at nighttime too as M’s sleep issues have been an ongoing problem that we continue to struggle with and every time we seem to be making some headway with it, something happens to set us back to where we were before. His broken leg has been no exception and has added to that regression as it has seen us playing musical beds with G moving to M’s cabin bed and Mike to G’s room to give M the comfort he needed to enable him to sleep in the weeks following the accident. The physical strain of looking after M with his broken leg has taken its toll on me, leaving me exhausted and Mike and I have had little time to spend with each other without interruption. Last Monday passed in something of a blur and proved to be a long day of travelling with more than its fair share of minor hiccups along the way, just to keep us on our toes. We were up at 3.30am to reach our regional airport before a 6.30am flight to Munich, followed by a couple of hours waiting at the airport before our shuttle bus arrived. Then there was the 30 minutes of pure stress as we failed to connect with the shuttle bus due to the unclear instructions as to where to wait that were written on the booking form and my tears of panic as Mike desperately tried to find a helpful German airport worker to help him communicate with the bus company, before all was finally resolved and the driver turned around to pick us up. The following 4.5 hours in a minibus without functioning air-conditioning and unable to communicate with said driver due to my lack of German and his lack of English was interesting, though we drove through some amazing countryside and realised that 4 countries in 1 day (UK, Germany, Austria and Italy) was a record even for us. We finally reached Lana, our Italian destination, only to discover that the cable car to the hotel – the only way to reach it – had broken down and we were destined to wait for an indeterminate amount of time as the statement that “..it might be 5 minutes, it could be 30…” was accompanied by an unconcerned shrug. But, we got there in the end and, having reached what is an amazing resort, it was, without a doubt, all worth it in the end. This entry was posted in Chronic Illness, Family, Food Allergies, Special Needs Parenting, Travels and tagged Allergy, Allergy and Freefrom Show, Awareness, break, cinema, Conditions and Diseases, date night, Dr Schar, EGID, FABED, Facebook, family, FB, food allergies, gluten-free, Gluten-free diet, health issues, holiday win, holidays, Italy, love, marriage, parenting, relationship, rest, restaurants, Sleep, sleep problems, sleeping arrangements, Social media, Special Diets, special needs, special needs parents, support, time off, travel, travelling Italy, Twitter, wheat free on June 13, 2016 by bluesingingdragon. Over the years, Mike and I have tried to nurture a growing passion for good food in both G and M, very much based on our own love of food, eating out and experiences of a variety of culinary delights from around the world. M has become a real foodie and has never been afraid to try something new, be it oysters at age 4 or E028 at age 9! Whether it’s because of the lengthy presence of T1D in my own life, or due to identifying food allergies in G from an early age, we have never been afraid to go into a restaurant and challenge their menu options to make sure there’s food there that we can all eat and enjoy. 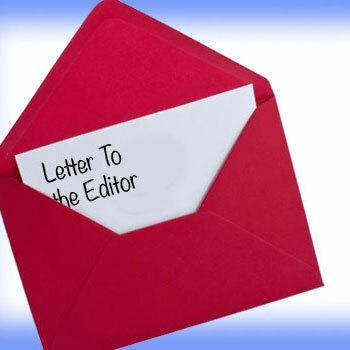 Not everyone is as confident in making these demands and I frequently see requests for ideas for safe restaurants in the many FB forums that cover the topic of food allergies. These anxious parents trust the experiences of others in the same shoes and appreciate the advice that is so freely and gladly given; but what do they do when there’s no-one else on-line to share their tips or with the knowledge at their fingertips? Up until recently, the answer was probably to wait it out, especially if they were too nervous to step out of their comfort zone and give somewhere a try, but thanks to a fellow allergy Mum, last March an amazing new website was launched to help the allergy world share their experiences and highlight restaurants that really can cater for food allergies. Can I Eat There? is the brain child of Nicky Granger, whose young son, Gabriel, lives with 9 severe food allergies. Nicky and her fantastic team, who have an impressive amount of allergy experience between them, have set up a website that gives “…people with food allergies the information they need to make sensible choices about where to eat. Like menus you can filter by allergy. Customer reviews from other people with food allergies. Forums for chatting and sharing experiences and advice. And the opportunity to put your questions and concerns to our expert partners…” – a completely new venture that is unlike anything else I have seen out there and that really answers a growing need. The premise is simple: the initial search engine on the site allows you to enter your location and then apply any filters you wish from a choice of: allergy, cuisine, rating, dietary or allergy awards, to suit your individual needs. Once these have been selected, the results are brought up, showing all restaurants in your chosen area that meet your requirements. At the most basic level, the restaurants listed will provide information about the restaurant type, the food offered and which food allergies they feel they can cater to. Some will have provided the CIET? team with a more detailed menu as well as full contact details and their website. What makes this website so fantastic in my opinion, is the ability for users to add their own reviews and experiences of the restaurants listed and give them a star rating for their attitude to catering for food allergies. These reviews are easily accessible under each restaurant’s listing and give the anxious diner an honest review of just how well the restaurant managed to meet someone else’s needs. This really is a unique resource for families living with food allergies and one that I hope will continue to go from strength to strength. The success of the website is, of course, dependent on not only spreading the word that it exists, but also encouraging people to take the time to add their thoughts and reviews about the restaurants they’ve visited, especially if they would recommend them to others or, indeed, warn other food allergy sufferers against going there. Needless to say, as soon as I first heard about CIET?, I contacted Nicky to find out how I could become involved with her new venture and am proud to be one of the allergy ambassadors and partners delighted to be working with CIET? as much as I can. 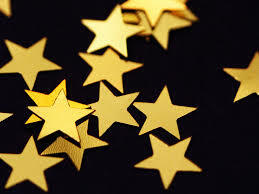 It really is a 5-star website and I wish them every success for the future. This entry was posted in Chronic Illness, EGID, Family, Food Allergies, Parenting, Reviews, Special Needs Parenting, Type 1 diabetes and tagged Allergy, allergy-friendly restaurants, Awareness, Can I eat there?, Conditions and Diseases, Dairy free, dining out, eating out, Egg free, EGID, elemental feed, Food, food allergies, gluten-free, Gluten-free diet, health issues, ill health, love, meals, meals out, NG tube feeding, parenting, restaurants, Reviews, Soya free, Special Diets, wheat free on February 15, 2016 by bluesingingdragon. Thank goodness for TGI Fridays! When you’re an allergy Mum, there is nothing better than finding somewhere your entire family can eat safely when you’re out and about. I spend a lot of my time in the kitchen when I’m at home, tweaking recipes and continually trying to find new, tasty and interesting ways to prepare 5 safe foods for M and sometimes I just want a break from it. We have found some firm favourites amongst the chains, who have not only been able to cook M-friendly food when we were excluding just 7 – remember those days? I just about can – but have also impressed us in the last 12 months too. From old faithfuls such as Pizza Express, Giraffe and Bella Italia, to newcomers Wagamama and Jamie’s Italian, my cup quite literally runneth over! Our holiday to Cornwall last summer led to the discovery of an amazing small independent restaurant who catered for M without hesitation and made all the difference on our first holiday with a tube. With the start of a new year, we decided to branch out and challenge yet another popular old friend, TGI Fridays. 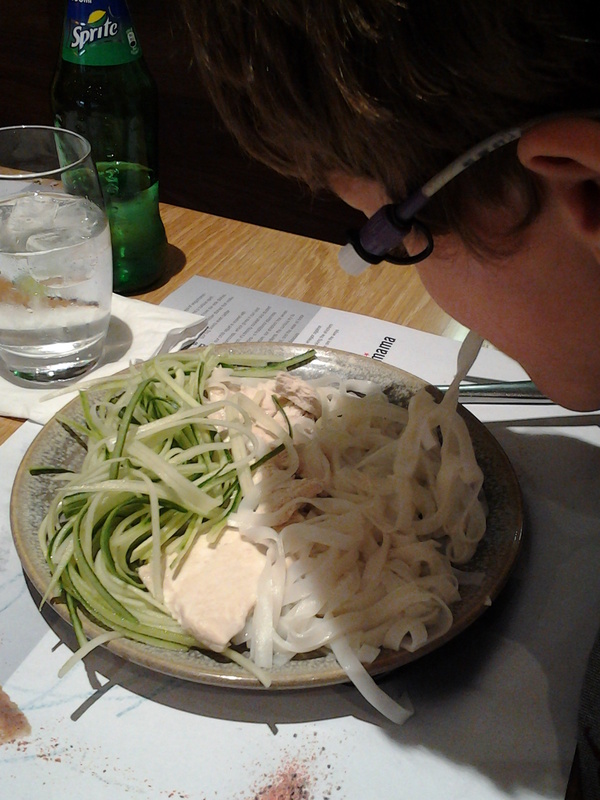 M has been reluctant to visit this restaurant since he went elemental last year and our first suggested meal out after he was discharged from GOSH fell sadly flat, when he refused to stay there because “..everyone around me will be eating chips Mummy…“. As we had not long had to stop the potato trial due to all his problems in hospital, Mike and I could totally understand and were massively impressed that, at long last, he’d been able to tell us his reasons for not wanting to stay. However, never one to be beaten by a near 10 year-old, I bided my time until we once again headed out for a small bit of sales shopping and decided to treat them to lunch as well. M’s first choice was Wagamama, but an ill-timed fire in their kitchen put pay to that idea and I tentatively suggested TGI Fridays as a potential alternative. Although only a couple more days had passed since our first attempt, M felt a little more able to challenge their menu and we set off on our brand new restaurant adventure. The first thing on our to-do list was to advise the greeter of our allergy needs as soon as we arrived at the restaurant and asked for a table. I always do this when we eat anywhere new, even when it’s just a new location of one of our known safe restaurants, so that neither child has to go through the stress and embarrassment of discovering they can’t cater for them and having to leave the restaurant. The greeter asked the restaurant manager to come talk to us as this is TGI protocol when dealing with customers with food allergies. We explained M’s dietary requirements and he reassured that they could prepare chicken, apple and cucumber for M, though sadly not any rice as their current rice dish contains a Cajun spice mix which we haven’t trialled with him as yet. With M happy that he would be able to eat, we headed for our table, ready to peruse the choices for the rest of the family. For those of you not in the know, TGI Fridays has a separate menu for allergies, which lists the lactose- and gluten-free options readily available. G was delighted to see such a selection of starters that were safe for her and begged to be allowed to try one of those as well as her main course. She opted for the BBQ houmous starter with corn tortilla chips, followed by the Bacon burger with fries from the allergy-friendly children’s menu. Having sorted our little Miss out, we’re turned our attentions to the more knotty problem of young Master M and here I have to say, TGI Fridays came into their own. The manager came to sit with us at the table, armed with a mammoth allergy information folder and cross-referenced every single menu item we were considering for both children to ensure the food would be absolutely safe. He advised us that they used separate chopping boards for the food preparation to avoid cross-contamination risks and showed an in-depth understanding of our requirements which reflected the extensive food safety courses I later found out the restaurant chain insists all their managers attend. The only potential issue arose when we discussed what oil M’s chicken would be cooked in as the restaurant uses either olive or the more generic “vegetable” oil in their cooking. As we are still limited to rapeseed and coconut oil only, I asked if the chicken could be cooked without oil and the manager went off to see what could be done. I was impressed to discover that before settling on that as an option, he had actually investigated whether they could get hold of any rapeseed oil from one of the neighbouring restaurants for M’s chicken breast, but had rejected that option when he discovered those restaurants couldn’t guarantee that there was no cross-contamination risk. Instead, the chefs prepared the chicken oil-free and the speed at which it disappeared from M’s plate is a testament to how well prepared and tasty this dish turned out to be. G’s food vanished in similarly quick fashion and Mike and I breathed a huge sigh of relief that our risky restaurant choice proved to be such a success. *following our visit, I discovered that TGI Fridays also have an impressive allergy menu on-line, which allows you to select the foods you’re avoiding to see what choices you have. This is a great tool to give you an idea whether they can cook for you or not, but nothing beats talking to the restaurant managers themselves. This entry was posted in Chronic Illness, Family, Food Allergies, Parenting, Reviews and tagged allergic reaction, Allergy, allergy menu, allergy-friendly restaurants, Awareness, Conditions and Diseases, Dairy free, eating out, Egg free, EGID, elemental feed, failing food challenges, family, Food, food allergies, gluten-free, Gluten-free diet, GOSH, NG tube feeding, parenting, potato, restaurants, restricted diets, review, Soya free, Special Diets, special needs parents, TGI Fridays, tube feeding, wheat free on January 25, 2016 by bluesingingdragon. As you might imagine, with that opening gambit, I couldn’t wait to get home from work to find out exactly how M’s classmates responded to the unusual piece of news that he was determined to share today. I suggested that he might want to explain a little more about our weekend adventures rather than just announcing this out-of-the-ordinary occurrence to the world, but knowing M as I do, I fear the finer details might be missing first time round. Despite suggestions to the contrary, our weekend was, in fact, spent in East Sussex and more specifically, in Battle at the site of the Battle of Hastings. G has been studying the events of 1066 in her History lessons this term and has shown a real interest in learning about the central characters of this Battle. I have a vivid memory of visiting the battlefield with my parents when I was about the same age as G is now and wanted to be able to create a similar experience for both G and M if I could. What better was to learn more about history than by visiting where it actually happened? 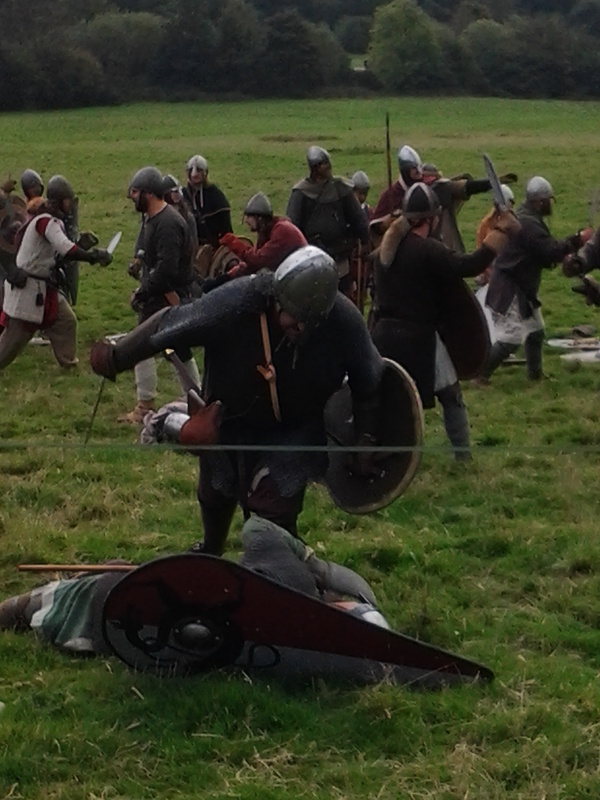 I started investigating the Hastings area and was delighted to see that last weekend was staging a re-enactment of the Battle of Hastings in advance of the 949th anniversary of the event itself. 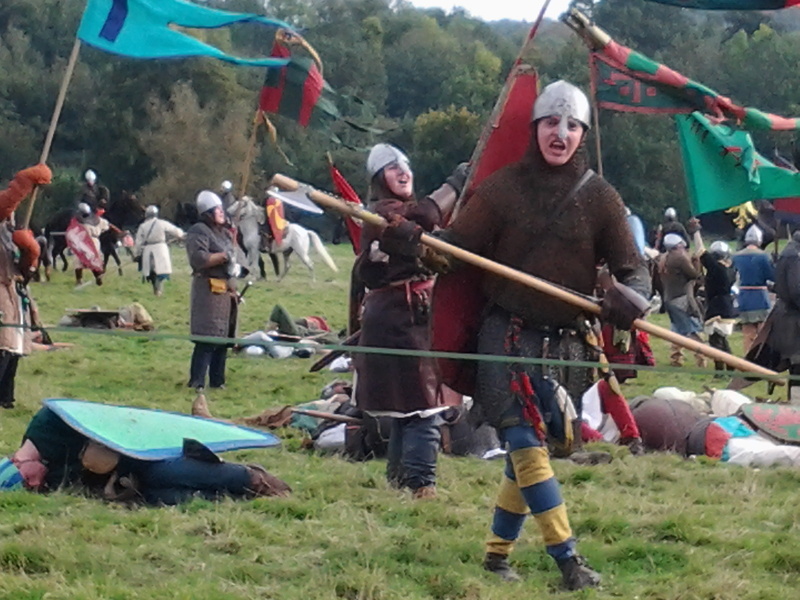 Much to my astonishment, we had a weekend free of any other plans, a rare thing indeed in our household and so we planned for a short East Sussex break, where the Battle of Hastings would be brought to life outside of the classroom and hopefully would become even more real in G’s memory. As always when planning a trip with M, I spent most of Friday rushing around from pillar to post in a mad dash attempt to make sure we had packed everything we could conceivably need during our 2 nights away from home. A slight lapse on my part meant that 3 hours were unexpectedly lost to a forgotten hospital appointment for me and another 40 minutes to training up the new school secretary on how to operate M’s pump, but we got there in the end and as soon as school and Stagecoach were finished, we started our pilgrimage to Battle. We arrived at Battle Abbey slightly ahead of schedule on Saturday morning and I am so glad we got there when we did. A great tip from one of Mike’s work colleagues meant that we had gone prepared with a couple of folding chairs amongst our possessions and we nabbed ourselves front row seats for the rest of the day. We explored the Saxon and Norman camps set up either side of the main arena, treated ourselves to a few trinkets, drinks and snacks and decided which events we wanted to see. We actually didn’t really venture too far away from the main arena itself as the children were fascinated by all that we could see and experience there. Mike was thrilled to be picked to be part of the first Falconry display and remarked on how surprisingly light the bird was as it landed on his arm. The children were enthralled by the impressive weaponry display, which showed the different types of weapons that would have been used by the cavalry and infantrymen of both armies and treated us, in our front row seats, to a frighteningly realistic charge by the opposing sides. 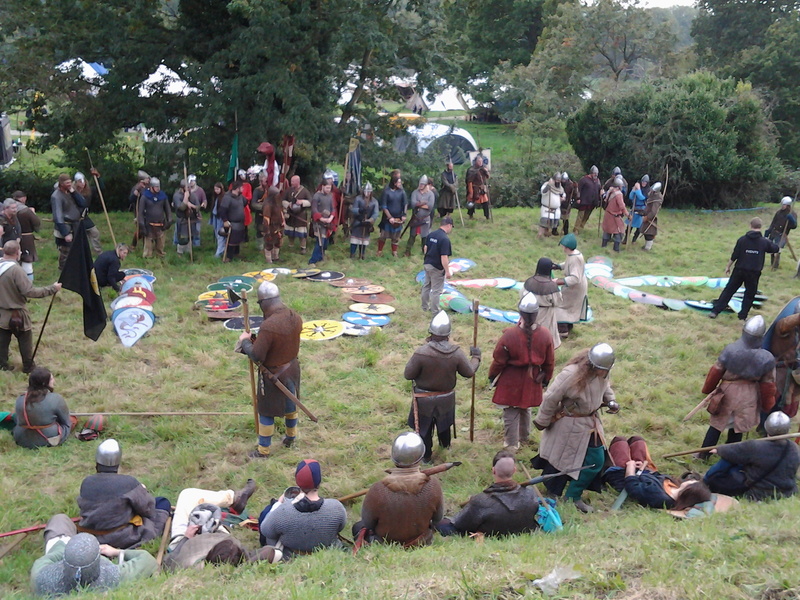 For many, the highlight of the day had to be the battle itself, which was acted out in front of us with a mix of live and recorded commentary to talk through and explain the events as they unfolded. I was impressed with G’s understanding of the tactics employed by Duke William’s army and she was able to hold her own afterwards when in discussion with 2 of the men involved in the re-enactment. It was a fantastic day out, the children now both have a greater understanding of this significant historical event and Mike broadened his knowledge of his adopted homeland too! Oh yes, and M was chased by a hawk, just as he said. 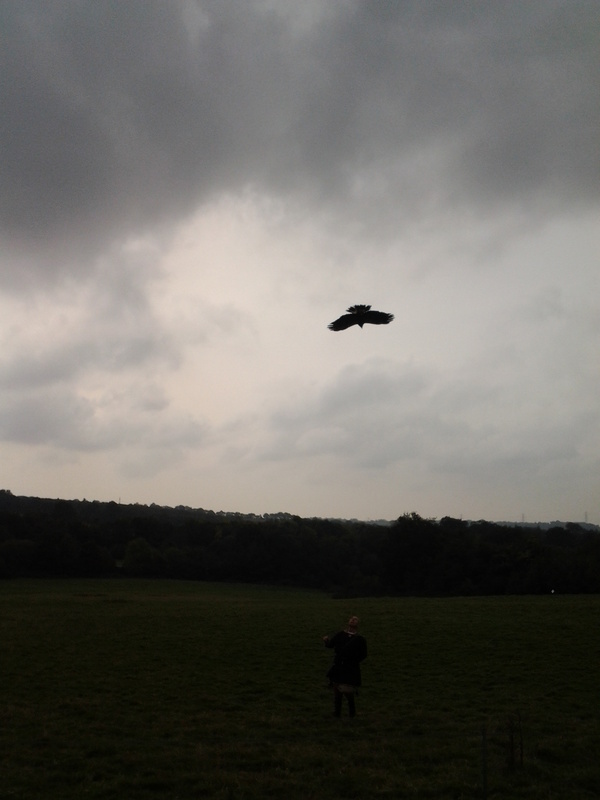 Following his in-depth conversation with the Falconry team during the day, they chose him to be part of the second display and gave him the job of dragging the decoy across the field at speed to show how fast and effective the Harris hawk is when it comes to hunting its prey. This entry was posted in Family, Parenting, School, Travels and tagged 1066, battle, Battle Abbey, Battle of Hastings, Battle of Hastings reenactment, chefs, Duke William of Normandy, East Sussex, Edward the Confessor, falconry, family, friends, Harold Godwinson, Hastings, hawks, holidays, hotels, love, meals out, parenting, reenactments, restaurants, school, Sussex, weapons, weekend, weekends away on October 12, 2015 by bluesingingdragon. Over the last few weeks, I’ve been blogging a lot about the new recipes I’ve been experimenting with and some fantastic restaurants we’ve found, who have been amazing at providing safe food for M. With food trials proving to be a far lengthier challenge than the medics imagined, the opportunity to gently encourage M back to enjoying eating out on occasion has been one we’ve grabbed with both hands in order to maintain some much-needed sanity and time-out from the kitchen. 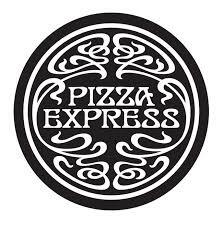 Our latest foray was back to an old favourite of ours, Pizza Express, as in the past 4 or so years we’ve enjoyed allergy-friendly meals out, school trips and birthday parties there. I thought it well-worth a return visit to see whether it could now meet our new and somewhat exacting requirements. Our lunch-time adventures started with a phone-call to our restaurant of choice to see whether they would be able to cope with M’s diet or not. Whilst we don’t always phone ahead, we were going to be in a part of the city where alternative choices were not readily available and we didn’t want to be trawling the streets with 2 grumpy and increasingly hungry children in tow. Mike spoke to a very helpful woman, who was able to confirm that they had plain chicken readily available and would be able to provide the chicken and cucumber parts of the meal. Unfortunately, as we have found in other restaurants, Pizza Express couldn’t cook plain rice for M, but were more than happy for him to eat from our own stash of rice-cakes or crackers whilst the rest of the family enjoyed our lunch. Armed with the reassurance we were after and having convinced a very reluctant M that we really needed to stop for lunch soon, we headed off to the restaurant. Our waitress was brilliant and didn’t bat an eyelid on hearing our requests for a gluten-free, dairy-free American pizza with goat’s cheese for G and a plate of plain chicken and cucumber for M as well as Mike and my more normal menu selections. The plates of food arrived and my picky pair set to trying it all out. The top marks out of 10 (an unbelievable 10/10 from M), empty dishes and requests for seconds that quickly followed were a sure-fire testament to the meal itself and we are delighted to have found yet another M-friendly restaurant for us all to enjoy. This entry was posted in Food Allergies, Reviews and tagged allergic reaction, Allergy, allergy-friendly, allergy-friendly restaurants, Awareness, Dairy free, eating out, Egg free, family, Food, food allergies, gluten-free, Gluten-free diet, love, NG tube, parenting, Pizza Express, PizzaExpress, restaurants, Soya free, Special Diets, summer, tube feeding, wheat free on August 20, 2015 by bluesingingdragon. This time last year I had holiday-planned to within an inch of my life and had experienced amazing support from the folks at Virgin Atlantic. 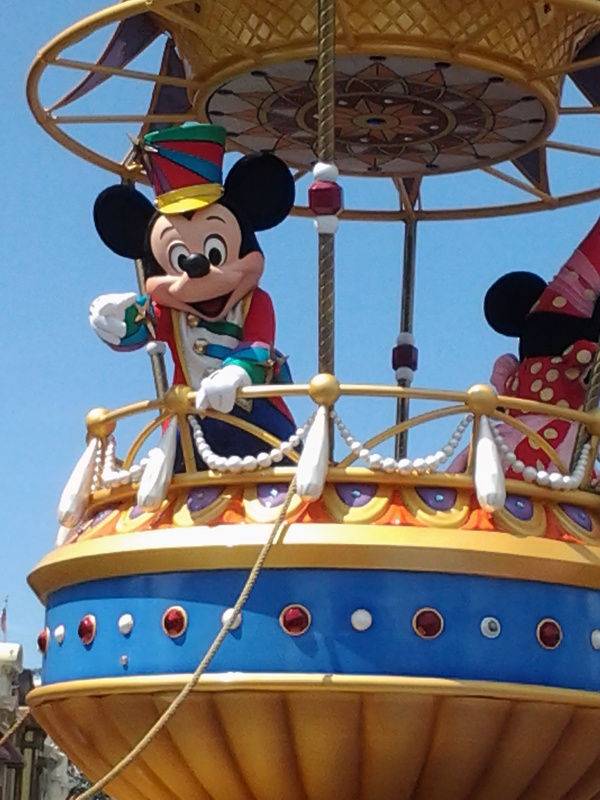 We had arrived at Disneyworld Florida, were impressed by the positive approach to M’s restricted diet shown by all and were loving our days in the sun. It really was a trip of a lifetime and we’ve all been reminiscing a lot about where we were and what we were doing this time last year. Our plans this year have been much less grandiose and much closer to home. When we first started thinking about our summer holiday plans back in November, all we knew was that M was going to be going elemental sometime soon and would have a NG-tube in place. We didn’t know if it would still be there by the time this summer rolled around and had no idea what he’d be able to eat or how we’d all be coping with the change. We toyed with the idea of a holiday in Portugal, a favourite destination of us all, but just weren’t sure how confident we would be if we needed to travel abroad with a tube in place. Of course, with the benefit of hindsight and nearly 9 months experience, I am sure we would have coped just fine, but the uncertainty of all we’d be dealing with meant that instead we opted for staying in the UK and so we are now on our countdown to Cornwall. 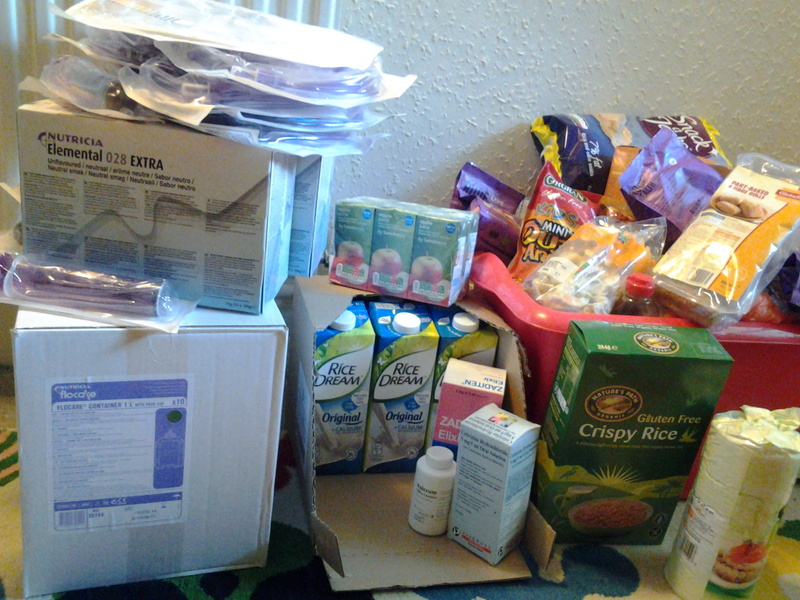 Our front hallway currently resembles a storage facility as I pull out ready for packing, not just clothes and beach essentials, but safe food supplies for both G and M and, of course, everything we’ll need for M’s tube feeds. We have each chosen a day-trip we’d like to do whilst we’re there as well as researching the beaches surrounding Fowey, our base for the week. Mike has spent time looking at various “wet-weather” options as there’s no guarantee of sun in the UK, even in August, and we have been able to pencil in a day with G’s godmother, Godmama C and her lovely family as they will be holidaying there too. We might be staying in a self-catering apartment, but we’re also hoping to venture out to eat and my time has been spent trawling the internet looking for allergy-friendly restaurants and emailing to find out whether they will be able to accommodate M’s current food needs. The great news is that a couple have already replied to tell me that they are up for the challenge and I can’t wait to try them out and share our reviews of just how well they did for both M and G with you all. Even better, thanks to timely posts from fellow bloggers such as The Intolerant Gourmand and dedicated websites like Can I eat there?, I’ve been given some great top tips for making this a holiday to remember. This entry was posted in Chronic Illness, Family, Food Allergies, Parenting, Special Needs Parenting, Travels and tagged activities, Allergy, Awareness, Can I eat there?, Conditions and Diseases, Cornwall, days out, E028, elemental diet, elemental feed, family, Food, food allergies, Google, health issues, holiday planning, holidays, Intolerant Gourmand, love, NG tube, NG tube feeding, parenting, restaurants, school holidays, Special Diets, stress free travelling, summer, support, tube feeding on August 12, 2015 by bluesingingdragon. Belonging to an on-line support community such as FABED is fantastic, but also really something of a mixed blessing. The joy of being able to build friendships, ask questions and sometimes simply celebrate a milestone with others through a deft few keyboard strokes is always tempered by the isolating knowledge that these families, walking a similar path to ours, might live hours away from us and chatting in person is not always easy to do. We have been lucky enough to meet up with some families over the last 4 years and have some amazing new friends who really understand the stresses and strains of living with a chronic illness. By far and away, one of the best benefits has been sharing recipes and restaurant recommendations and it was following such advice from a fellow FABED Mum that we recently ventured into a completely new dining experience for us all. To say we were impressed from the moment we stepped through the door of our local Wagamama restaurant is no overstatement and not one part of the experience that followed let them, or us, down. I’ve learned to broach the subject of M’s complex dietary requirements at the restaurant door to save heartache all round and their greeter not only made a sensible suggestion based on the short list of safe foods I gave him – Mini grilled chicken noodles minus a few ingredients – but also headed off to talk to both the chef and the restaurant manager to confirm they could prepare a tasty meal for M that would be as free from cross-contamination risks as they could make it. Reassured that they could accommodate his food needs, we took our seats before perusing meal options that would also suit the rest of the family. Whilst M was hugely excited about having rice noodles for his dinner, G was less keen, but with 3 different types of rice available, even my pickier eater was happy. The restaurant manager acted as our waitress and was invaluable in helping us make sensible choices for all the family and our differing allergy requirements. The greeter had done a great job of passing the information on to her and she started by addressing how they would prepare M’s meal to ensure it was as M-friendly as possible. As M is only able to tolerate rapeseed and coconut oils at the moment, the chef suggested they steamed him a fresh piece of chicken, which had not been marinated, and which would not have the risk of picking up any food or oil traces from their other pans. They also cooked a fresh batch of rice noodles, again in a clean pot to avoid obvious cross-contamination and served them with a healthy portion of cucumber “noodles” – a meal fit to tantalise our young foodie’s taste buds. The plate that appeared was impressive and M gave the meal a well-deserved 9/10 (he wasn’t so keen on the cucumber noodles and docked them a mark for that presentation!). G chose a stir-fried rice and chicken dish (Mini chicken cha han) from the children’s menu and we saw, once again, the impressive and extensive knowledge the restaurant staff had about their food when I asked if the dish was both gluten- and dairy-free. The manager knew without checking that the sauce contained gluten and advised that most of the other sauces they use in their dishes do too. However, she was able to recommend Tamari sauce, which is gluten-free and would add great flavour to G’s meal. 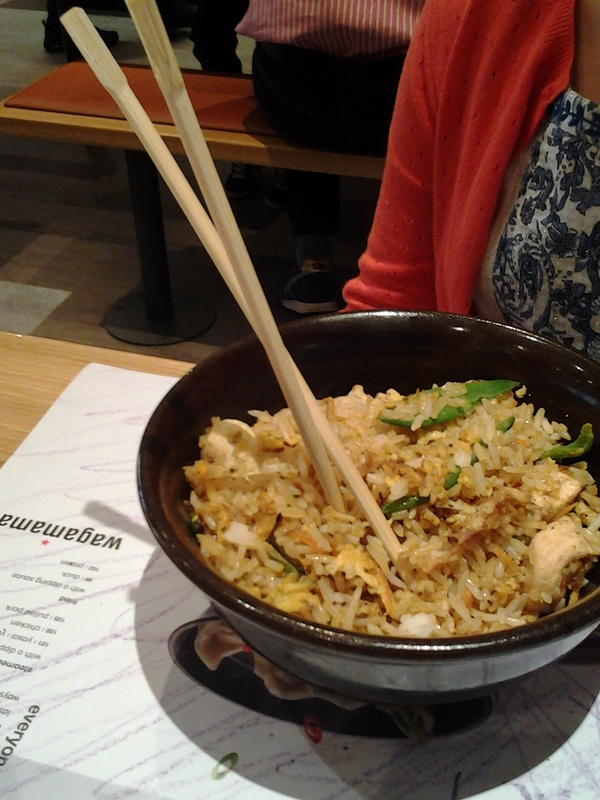 G was as delighted as M when her bowl arrived at our table and she awarded them a well-deserved 9.5/10. Mike and I were not only thrilled to have found a restaurant that was hugely capable of meeting our exacting requirements, but also had great meals ourselves. The service was fantastic and when a small error resulted in the wrong side dish arriving at our table, they prepared the one we’d originally asked for and gave us the wrong one for free. Back in March of this year, there was a furore when newly introduced EU legislations required restaurants to provide information about the top 14 allergens contained in their menus and over 100 top chefs and restaurants condemned the requirements as an unnecessary and inconvenient constraint on the spontaneity and creativeness of their profession. From the faultless service to the extensive menu knowledge, every single thing about our meal at Wagamama screams out that no chef worth his salt need be worried about such demands and I wouldn’t hesitate to recommend this restaurant chain to anyone looking for an allergy-friendly place to eat. This entry was posted in Family, Food Allergies, Parenting, Reviews, Special Needs Parenting and tagged allergen menu, Allergy, allergy friendly asian food, allergy-friendly, allergyfriendly, Awareness, Dairy free, eating out, Egg free, FABED, family, Food, food allergies, gluten-free, Gluten-free diet, parenting, restaurants, rice noodles, Soya free, Special Diets, Wagamama, wheat free on July 28, 2015 by bluesingingdragon. If your family is anything like mine, that question usually comes just as you’re struggling through the door: with house keys in one hand, car key gripped firmly between your teeth, handbag on one arm, cello on your back, mobile phone pressed to your ear as you attempt to talk to the dietitian/consultant/other healthcare provider, who’s asking if now is a good time to talk and you can’t say no as you’ve been trying to contact them urgently for at least the last 3 days and who knows when they might call again; plus the school bag(s)/shopping bag(s)/extraneous bag(s)* (*delete as appropriate) you’ve picked up along the way are weighing down your other side and threatening to upset the delicate balance you’ve perfected in your struggle to cover the 100 yards or less from your car to the house. Meanwhile, your curious offspring are waltzing in behind you, or possibly squeezing past you, through the already impossibly small and too-narrow-to-negotiate-safely doorway, bearing no more than a half-empty water bottle and their coat, worn superhero style to leave their hands free to carry absolutely nothing else at all. And just as you think you’ve achieved it and managed to get everything safely inside, they open their mouth and ask that unavoidably fraught dinner-question and the peace shatters and your world tumbles down around your ears. Does any of that sound familiar or is it just my household? For M at the moment, my answer is fairly standard, although he adds his own unique twist by asking if dinner will be “chicken with rice and cucumber” or perhaps “rice and chicken with a side of cucumber”? For a while, when he was still 100% elemental, he would even ask if he could have “air-sticks” – “like bread sticks you see, but without the bread” – showing that the ability to laugh his way through this experience is his greatest strength in beating this disease. I have become a self-confessed expert in cooking with 3 principle ingredients – rice, chicken and cucumber – and the bonus extras of herbs, rapeseed oil and sugar. Rice has been broadened to include its derivatives and the inclusion of rice milk, rice cream and rice pops (as long as they’re gluten-free) has added to my ever-increasing repertoire of 3-ingredient recipes. 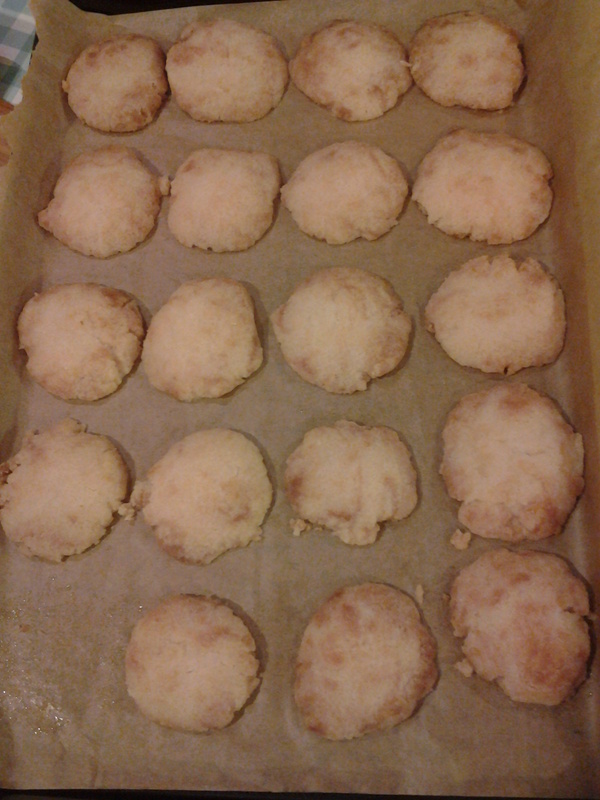 In the past few weeks, as well as my fall-back favourites of roast or grilled chicken with plain boiled rice, I have also perfected deep-fried savoury rice balls, chicken nuggets, chicken and cucumber curry, fried rice, chicken stir-fry, rice-flour sugar cookies and rice pudding. My Mum has also made M a chicken breast stuffed with rice and cucumber, courtesy of the inspiration and some nifty hints suggested by our hairdresser and which was an instant hit with our young diner. It’s surprising just how many different recipes you can create with just a few ingredients and there’s even a few more that I’m hoping to try out in the coming weeks. What started out as a daunting challenge to entice M’s appetite and encourage him to once again eat whilst navigating the tricky world of identifying his food allergies, has become yet another success story in our household. Like so many others in my situation, I wrote a response on the Telegraph website, pointing out that this legislation will help me to protect my children and give them experiences that will ensure their continued health and enjoyment, I do not deny that it’s up to me (and they as they grow older) to ask about allergens, but there’s no point asking these questions if the restaurants, waiting staff or chefs cannot provide the information needed and the lack of understanding about cross-contamination risks is sadly common across the food industry. Our experience last summer in Disney proved that this type of requirement does not need to be restrictive as excellent allergen information was readily available and nearly everywhere we ate produced meals for G and M that rivalled those being served to any other customer there with a “normal” diet. The chefs were knowledgable, came to our table to discuss their allergy needs and made the effort to find out what my challenging duo would like to eat – excellent service all done with a smile. The big challenge was always to cook M-friendly food and these days that task has become even more testing. In my opinion, these rules will have little impact on spontaneity or ingenuity – try cooking or baking when you need to avoid wheat/gluten, egg, dairy, soya and potato to name but a few. Ingenuity comes when you try to prepare a meal that makes your child feel that they’re not missing out and that’s something I feel I’ve proved is possible, even for an amateur cook like me. This entry was posted in Chronic Illness, EGID, Family, Food Allergies, Parenting, Special Needs Parenting and tagged allergic reaction, Allergy, allergy-friendly, Awareness, Baking, chefs, Chronic Illness, complaint, Conditions and Diseases, Daily Telegraph, Dairy free, Disney, Disneyworld, E028, eating out, Education, Egg free, EGID, elemental diet, elemental feed, Eosinophilic, family, Florida, Food, food allergies, friends, friendship, gluten-free, Gluten-free diet, health issues, letter to the editor, love, NG tube, NG tube feeding, NGT, parenting, raising awareness, recipes, restaurants, Soya free, Telegraph, wheat free on March 30, 2015 by bluesingingdragon.